I’ve been riding the NYC subway lines for nearly a decade now and must admit that sometimes, when I’m waiting for a train, I look into the darkness of the tunnel and have an urge to jump down and follow the tracks towards the blue light and wherever they lead me. I actually thought that this must be a pretty common feeling, given the propensity of graffiti on the walls between stations, but when I revealed this desire to some friends a few weeks ago, they gave me a long, hard look and quite clearly told me that this feeling, was in fact, not normal. I think I need new friends. Well, don’t get me wrong, I love them, but sometimes I do wish that they were more adventurous. 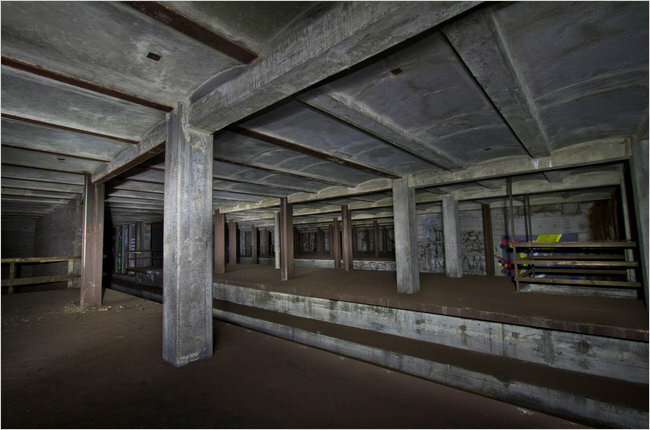 Especially when stories like that of the Underbelly Project breaks and it was revealed that yes, there are no shortage of people who are willing to hop down into the tracks and wander into the darkness in order to explore the bowels of the NYC underground and leave behind hidden treats for subsequent adventurous spirits. And what a treat it was for street art followers on Halloween, when the most comprehensive street art exhibition ever put together was unveiled by a freelance journalist by the name of Jasper Rees in the New York Times and in the National (it was also in the Sunday Times London, but you need a subscription to read that article). Since then, the word on the lips of every street art junkie has been “Underbelly.” Except this exhibition was actually a trick: the art wasn’t on the street, and almost no one will ever be able see it. 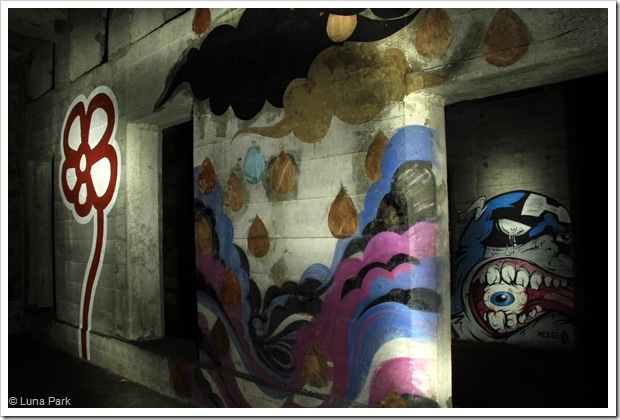 Aptly named “the Underbelly Project” because it’s part of the hidden underground of NYC, the Underbelly Project has taken graffiti and street art back to its non-commercial roots, echoing the prolific period of NYC subway art of the 1970s and 1980s. It wasn’t hard to figure out which abandoned station the Underbelly Project resides in (as I always say, with a bit of fingerwork, you can figure out anything with the help of the Internet). Since the exhibition was made public, urban spelunkers and subway lore fanatics have pinpointed the site to be that of the Broadway/South 4th Street Station in Williamsburg, Brooklyn. The history of the station is also a fascinating one (read more here): back in 1929 and 1939, when NYC was working to build up its subway system, Broadway/South 4th Station was to be a major transfer and connection point for the IND Second System. However, work began before the city even knew if funding for the remainder of the line would ever materialize. When World War II and the subsequent onset of the automobile age put a grinding halt to subway expansion, the project was halted and the 6 track station remained incomplete. Therefore, the South 4th Street Station is not an abandoned subway station (as it had never been functional) so much as it is a forsaken dream. However, it was at this shell station that two NYC street artists, PAC and Workhorse, realized a different dream: to showcase the work of a collection of street artists (both graffiti artists and fine artists) together in a non-commercialized exhibition space. 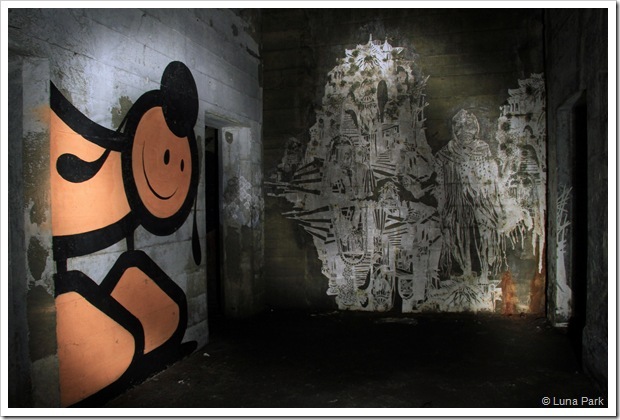 For the past 18 months in a series of about 75 visits, Workhorse and PAC have been escorting a total of 103 artists into the station to leave their creative marks on the walls. The rules were simple: only one trip per artist, which meant that they had about four solid hours to paint and had to walk into the site with all the equipment that they would need to finish their work. 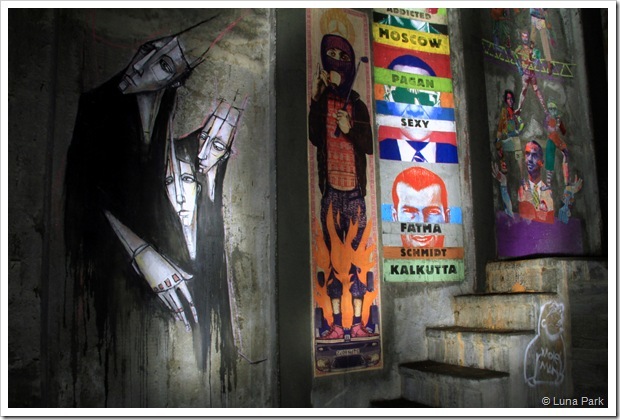 What I personally find most fascinating about this project is the representative cross-section of street artists. An estimate by the organizers pegs about 10% of the artists as female (which seems fairly representative in my opinion). Additionally, there are a good mix of both established and new artists, and quite a few international artists as well. 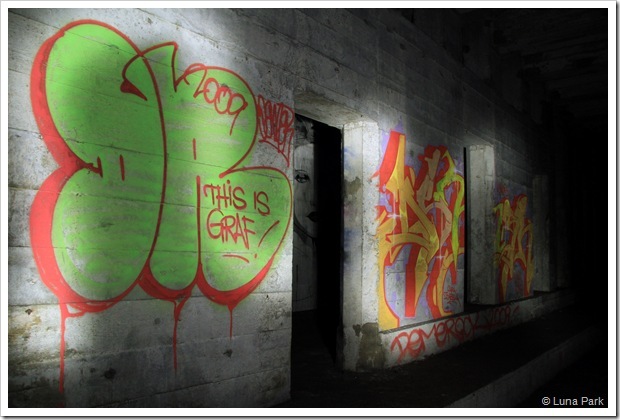 Most interestingly, graffiti artists and fine artists have works exhibited side by side without the disconnect and friction that is sometimes seen above ground. 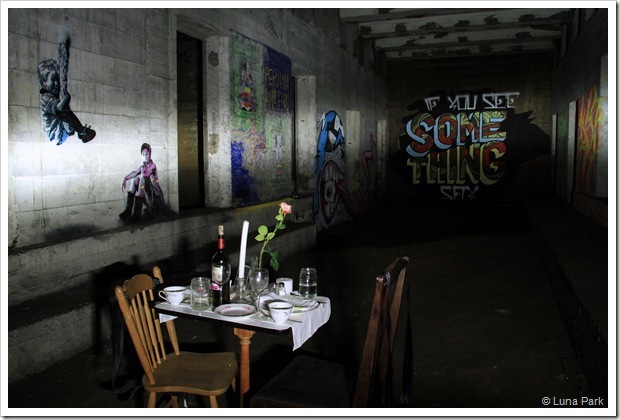 Works by graffiti artists such as Demer and Asylum are next to works by fine artists such as Swoon and Ron English. The roster of artists drawn to the project by the organizers is very impressive (although we must remember that these are friends, or referrals, so please don’t think of this as a “Best of Street Art” list, but rather those who were both in the know and able/available to work in NYC). From various sources, we can identify the works of Boxi, Ethos, London Police, SheOne, Remi Rough, Stormie Mills, Damon Ginandes, Lucy MacLauchlan, Swoon, Logan Hicks, Aiko, Faile, Ron English, Flying Fortress, Imminent Disaster, Dan Witz, Elbow Toe, Ripo, Peru Ana Ana Peru, Michael De Feo, WK Interact, Roa, Specter, Demer, Momo, Posterchild, Saber, Trusto Corp, Sinboy, Cash4, Rone Nick Walker, Revok, Ceaze, Know Hope, L’Atlas, M-City, Mark Jenkins, Meggs, Kid Acne, Lister, Jeff Soto, Smith/Sane, Gaia, Noh J Coley, Jim Darling, Thundercut, Daryll Peirce, Surge, Spazmat, Ema, Joe Lurato, Guilerme, JMR, Asylum, Gould, Indigo, Jeff Stark, Bigfoot, Kid Zoom, Strafe, to name a few (no particular order). While I understand that this is a completely valid train of thought, I disagree with its sentiment. Look, I understand the desire to be naughty and self-indulgent and to go against the establishment. 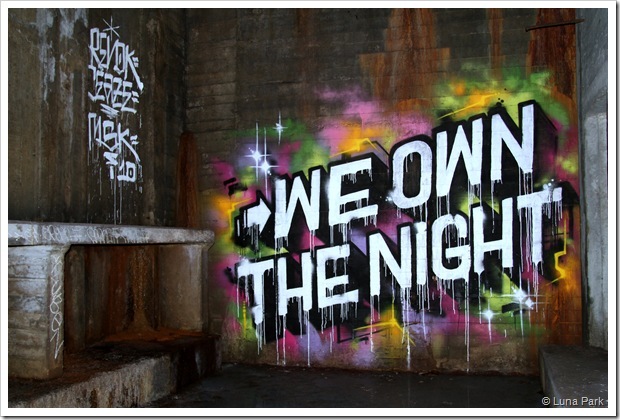 But street art isn’t just the newest hot commodity that’s been appropriated by every Sharpie-welding, sticker-slapping, stencil-making egomanic who wants to make a buck: it’s a great mode of expression and still attracts and inspires a certain type of recklessness. And yes, while a part of me despises the commercialism of the art game, we’ve got to realize that all this attention isn’t necessarily a bad thing: in fact, it’s legitimizing a form of art that should have been recognized as such decades ago. And I think that street art and graffiti deserves that kind of attention, and deserves to be recognized as an important urban cultural movement and genre in art history textbooks. So in that sense, I completely agree with the lads at Graffoto (as in, don’t blame us for wanting to legitamize and expose your secret lifestyle). But I do respect and admire the fact that Underbelly has brought the risk back into art, and at least they’ve admitted that their interest was in creating art for the sheer sake of creating art, and that they just wanted to get a bunch of people together and do something a bit reckless that harkened back to the golden days of subway art. I’m glad they’ve gone to the press to let the world know about it, too. It might sound a little self-serving to the untrained ear, but the implications are much larger: art can exist everywhere, and artists are still having fun creating it. And with the shift of this type of art into the gallery-space, where trained curators will recontextualize it all and trained conservators will be concerned with its archival preservation, I think that this project was very important in that it it will serve to function as a last great guerrilla hurrah. But of course, there are those of us who will still want to search out street art, or hidden architecture, or an urban adventure. To those of you who are tempted to search out this particular underground adventure, I would highly advise against it, as it’s both dangerous and illegal. Since news of the project broke, it has been revealed that much of the art has already been tagged up by a few disgruntled locals, and a few dozen people have been arrested in their attempt to climb down into the tracks in search of the artwork. The MTA, as is expected, don’t seem too pleased about the revelation of the Underbelly Project, and have taken a few measures of their own to prevent exploration, including stationing plainclothes cops on the platform. Though they have reiterated that such wanderings are deemed illegal as trespassing, they have simultaneously assured the public that they won’t be taking any measures to actively remove any artwork. (Though, as a conservator-in-training, I feel this point is moot and am forced to shake my head at PAC’s hopeful assessment that the pieces of the Underbelly Project will last three or four decades. In the end, it’s no more permanent than the art that many of these artists have created above ground.) Therefore, this unfinished station will retain these artworks as a poignant reminder that street art is ephemeral, and that no matter how hard we look, we’re bound to miss some of it. Instead, keep your eyes and browser on the Underbelly Project website, which promises completion soon and will likely feature a comprehensive list of contributing artists, more photos, statements, and hopefully time-lapse video. Until then, the New York Times article has provided this video for your enjoyment. Also, please note that most photos in this post (except for the wide angle of the station, that was from the New York Times) were taken from Luna Park’s site. Definitely worth a visit, as she has managed to capture a significant portion of an unbelievable body of work. Though advertised primarily as a boutique featuring highly sought after vintage garments from haute couture designers, The Garment Room is not merely another trendy SoHo clothing store. In fact, it’s probably the one of the larger and more diverse testaments of street art in New York City. This becomes evident as you descend the staircase into the lower level (where you are first hit with an explosion of grunge-style art and are swept back into what a punk club or a subway tunnel must have looked like in the 80s). 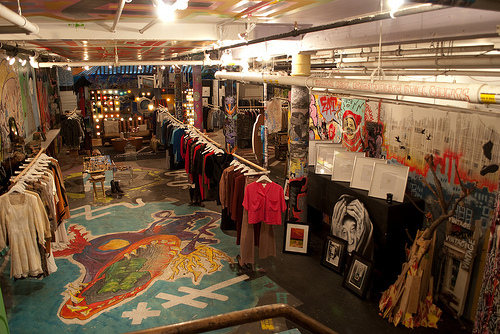 Inside The Garment Room, the juxtaposition of haute couture with the colorful street art is definitely unexpected. 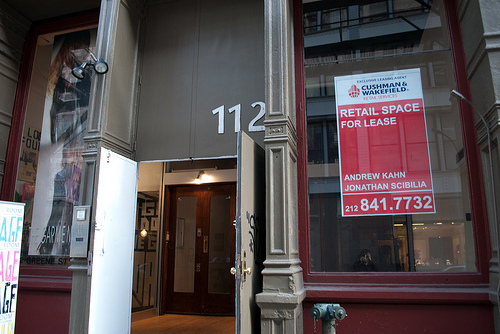 Once known as the infamous 112 Workshop in the 70s and 80s, 112 Greene Street originally offered exhibition space for the first generation of conceptual and performance artists who emerged as the Vietnam War and racism were ripping the country apart and the economy was tanking. It was there that new genres of art such as installation and performance were invented and some of the most influential artists of the day came to create and collaborate. Most of the work was made on site and artists were given almost complete control to curate their shows and create works to challenge and inspire the public. 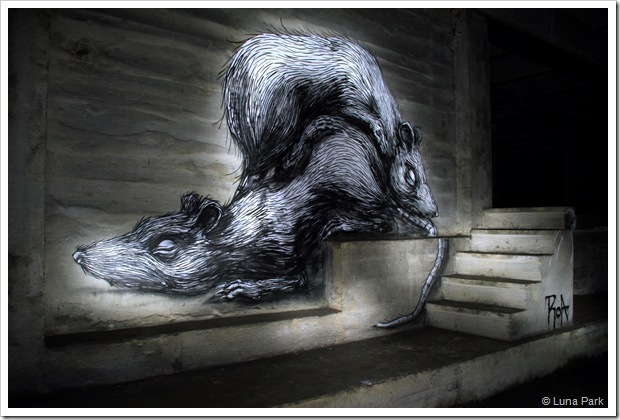 Embodying the very nature of street art, artists used found and ephemeral objects to site-specific installations, accepting that their work would probably not last the week. 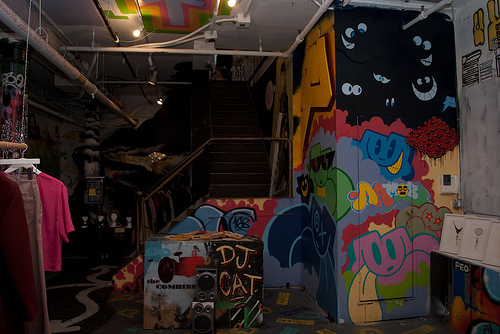 About a year ago, before The Garment Room moved into 112 Greene Street, monster street artist and Harlem native Royce Bannon (a central figure in the Endless Love Crew collective) curated a show with music producers Steven Loeb and John Robie that was intended to allow the space to reclaim its original purpose: being an alternative space for the exhibition of art. 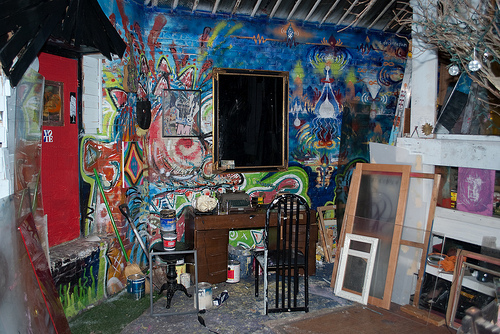 This show, in effect, created the backdrop to what would eventually become The Garment Room. 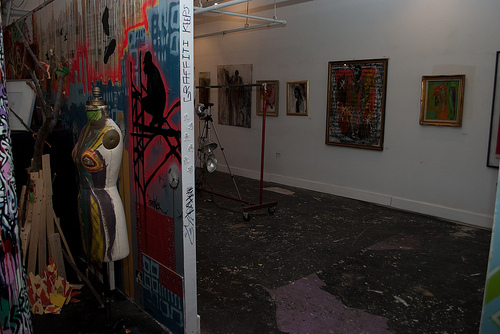 The show “Work to Do,” featured dozens of street artists (many of whom are also associated with the Endless Love Crew collective), remained intact as the property was transferred. With paintings on the pillars, walls, floors, and ceilings, The Garment Room continues to be a veritable explosion of visual stimulation. Rather than delete this important part of 112 Greene Street’s history, owner Tiffany Nicole has maintained the pieces as a tribute to the spirit of collaboration and lively discourse inherent to this space. 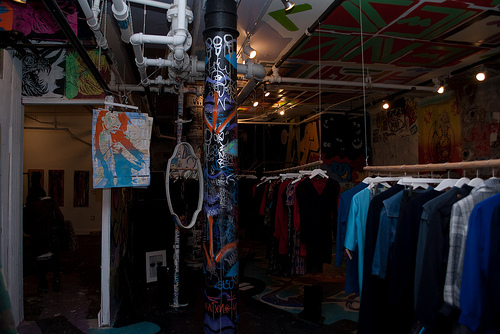 In this way, The Garment Room definitely stays true to the idea and history of 112 Greene Street. Tiffany Nicole is not only the owner of The Garment Room, but curator of current art exhibitions there as well. 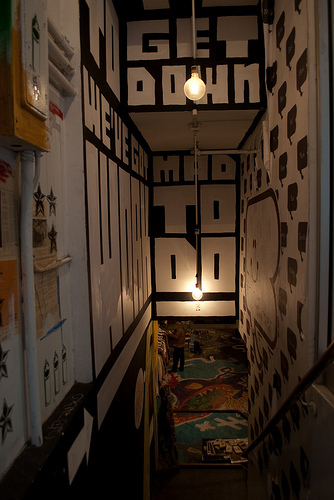 Staying true to the ephemeral nature of the space, she is constantly updating the space by inviting artists to add their creativity to the space by spraying on the walls (such as NME and Leif), creating installations (such as with the lightwork of Dean Radinovsky), and showcasing their artwork (such as Victor Koslov and Fernando de Souza) in The Garment Room. Adhering to the tradition of creation, a section of The Garment Room has even been retained as an exhibition room and active studio space for visiting artists. Most people go to 112 Greene Street with the intention to shop, but to those who come specifically to look at the paintings and installations, the employees are very helpful in assisting with inquiries and are as knowledgeable in talking about a piece or an artist as they are in talking about clothes and designers. They let you poke around and explore the hidden corners of the shop which is covered to the last square inch.To take pictures, they ask only for a small donation that will go to funding visiting artists. I talked with Jason, who was able to give me some insight into the history of the establishment and point out some of the pieces, and Dean Radinovsky, an artist who dropped into The Garment Room as we were talking. 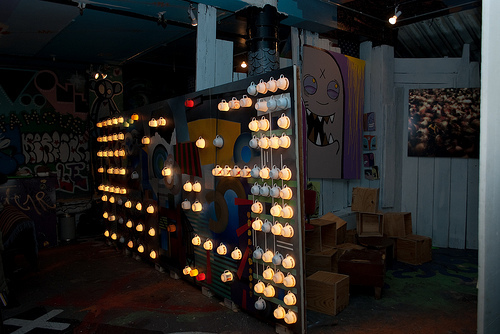 Although we can’t characterize this collection as street art because it does not influence the urban landscape, it is worthy of mention and a visit not only because the work of several dozen urban street artists are prominently featured in this space, but because it represents street-artist collaboration and a non-traditional collection as well. Whether you enjoy art, design, or fashion, there’s something for everyone who values culture to enjoy there. Normally open Friday to Sunday 1-7, The Garment Room is definitely worth a visit. Special thanks to my good friend Ryan, who came exploring with me and took about 70 awesome pictures of this space. I only posted a selection because you really need to see this place for yourselves!